What came first, beer or wine? Beer references date back to at least 3100 BC along wine production dating back further to 6000 BC. Both glorious man made beverages still with us today. It has only been in the last decade that the two have competed head on as the best beverage to pair with food. One of the great games for a sommelier is the pairing of wine and food. We think in terms of complementing or contrasting flavours, textures, creativity, and regionality when trying to create the best pairing experience for the dining guest. The equally passionate Cicerone (beer sommelier) strives for the same success using a lower alcohol carbonated beverage. Both camps are trained professionals, Somm’s can train through the International Sommelier Guild, WSET, and the Court of Master Sommeliers. Cicerones have the Cicerone Certification Program, the Prud'homme Beer Certification, Siebel Institute of Technology, and World Brewing Academy in Germany, and the Beer Academy Accredited Sommelier program based in the UK. Like the Sommelier training programmes, the cicerone/beer sommelier programs, despite being relatively young in origin focus on levels of training with detailed syllabus and accreditation levels. The US based Cicerone Master Cicerone program has only had seven graduates with an annual pass rate similar to that of the WSET Master of Wine programme since its inception since 2007. 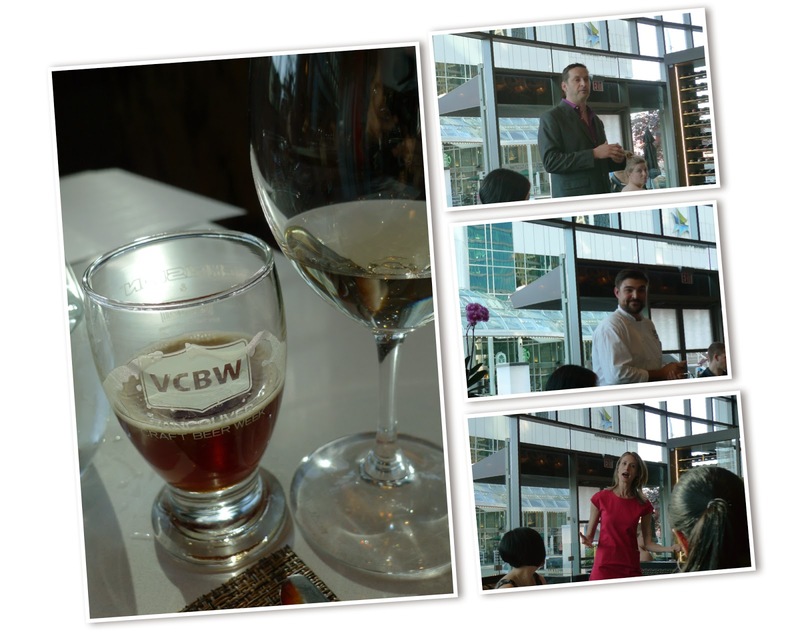 This year’s face off during Vancouver Craft Beer Week was with Sommelier Michaela Morris of House Wine and Cicerone Don Farion of Bomber Brewing/ BierCraft Restaurants paired with the creative food of Chef Alessandro Vianello at the Fairmont Pacific’s ARC. This was cicerone Don Farion's second win over a sommelier. Straw green with aromas of lime and green tree fruits. Medium-bodied, zesty acidity, nicely structured with a rich mid palate and flavours of lime, pear, a hint of melon, faint vanilla, and some herby complexity. Rodenbach Classic Flanders Red Ale 5.2% Belgium medium-bodied with sour berry, plum, fig, and subtle balsamic notes. Lightly carbonated. On paper the Vinho Verde should have won based on regionality. Portuguese whites shine with abundant Atlantic seafood. In reality the Rodenbach paired better with the salinity of the dish and the wildcard the rhubarb beads. The flavours of rhubarb were a perfect complement to the beer's sourness. Beer Wins. Yellow gold colour with aromas of ripe lime, apple and a hint of petrol. Medium-bodied, bone dry, lots of concentration, citrus, mineral, apple, and petrol flavours. Complex. Cloudy unfiltered old gold. Medium to full-bodied with typical “hefe” notes of banana, spice (clove), and grapefruit. Good amount of carbonation. This dish was a good pairing for both the beer and wine. The carbonation level along with fruit and spice flavours of the beer were great with the smoked potato and creme fraiche. The body, structure, and concentration of flavours of the Riesling paired with all the elements of this richly textured dish. Wine Wins. Cherry red colour. Intriguing aromas of red cherry liquorice, herbs, and minerals. Medium-bodied, soft tannins, good acidity, and flavours of cherry, raspberry, dried mint, flowers, and a touch of dried orange. Served slightly chilled - brilliant. Very dark mahogany colour. Aromas of cocoa, coffee, and roasted malts. Medium-bodied with a creamy texture and flavours of roasted oats, chocolate, coffee, and some charred spice notes. Lightly carbonated. Opaque and inky. Aromas of mint, menthol, and cassis. Full-bodied, excellent balance of acidity and tannins. European styled with complex notes of blackcurrant, leafy wild berries, cedar, and warm spices. Light amber colour with aromas of Normandy apple, herbs, and a hint of hops. Medium-bodied, good carbonation, and flavours of earth, herbs, malt, pepper, and restrained hops. Lamb and Cabernet a perfect match! The savoury herb notes of the minted peas was a perfect balance for the flavours and and aromas of the Australian Cabernet. The restrained styling of the wine, reminiscent of a richer vintage Bordeaux, paired extremely well. The sweetbreads were not an ideal wine pairing, the tannins of the wine enhanced the offal like flavours of the ingredient. Cicerone Don Farion mentioned the challenge of matching greens with beers, this saison however was a wonderful pairing, to the mint and peas with its complementing earth and subtle herb flavours. The sweetbreads faired better with the beer by balancing the earthy flavour profile. A tough personal call; but the wine was a better overall match. Wine Wins. Straw yellow with aromas of orange and apricot sorbet. Light-bodied, elegantly sweet with balanced acidity and some petillance. Flavours of orange, nectarine, and a hint of savoury herb and green tea. Light red amber colour. Aromas of strawberry shortcake. Light-bodied and very sweet with strawberry, orange, and a hint of coriander. Good carbonation. It was interesting that neither the cicerone or sommelier paired anything local with the food matches. As a Sommelier, I would have also looked further afield for wine matches, based on the menu. BC wine is still a challenge based on price point and value. Possibly next year's competition could incorporate a local craft beer and wine into one of the dishes or consider even one blind beer and wine pairing to enhance the challenge? Overall a great night that proves both a glass and a pint make good friends over food. visit:Baacco The Community Based Wine MarketplaceHi very thanks to the person who made this post, this was very informative for me. Great website...and cool article man...thanx for the great post...keep on posting such articles... Resources like the one you mentioned here will be very useful to me! I will post a link to this page on my blog. I am sure my visitors will find that very useful.